Quoting from "Indian Opinion" (April 14, 1906), Roy says Gandhi believed in not side with either the “Kaffirs [Zulus]” or the White rulers. “We are in Natal by virtue of British Power. Our very existence depends on it. It is therefore our duty to render whatever help we can”, he said. While praising Gandhi for leading the struggle of the “passenger Indians bravely, and from the front”, when two thousand people burned their passes in a public bonfire”, Roy points towards how “Gandhi was assaulted mercilessly, arrested and imprisoned”, but does not fail to “expose” his dislike for the “Kaffirs”. 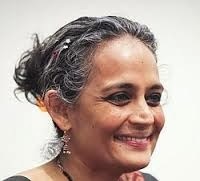 Really I do NOT care for Arundhati Roy, who is praised by Rothschild media, only because Syrian Christians are Jews. Arundhati Roy, a Syrian Christian with a Hindu name does NOT know that both BR Ambedkar and EVR Periyar had written that they do NOT want the white invader to leave India. Rig Veda (1200–900 BCE) was written 4000 year earlier in 5000 BC than what she has alluded to. Basava was a Jew Rothschild back dated creation. Veerashaivas were fooled into burying their dead bodies by rothshild. They are NOT hindus as Hindus are cremated. All these fourteenth century Bhakti poet-saints—Cokhamela, Ravidas, Kabir, Tukaram, Mira, Janabai—were all created by Rothschild to drive fissures into Hindusim for divide and rule , and back dated. She does NOT know that Raja Ram Mohan Roy was a Rothschild Opium drug runner. She does NOT know that Dayananda Saraswati ( Arya Samaj ) was pumped up by Rothschild to beliitle Hindusim. CNN-IBN POLL, THE "GREATEST INDIAN SINCE MAHATMA GANDHI" , SHAM AWARD - CAPT AJIT VADAKAYIL .